So I've seen there's a ton of interest in this, so I made this thread so planning / offical maraton stuff could begin since we all need the help attending AGDQ (espically WMJ and Yazzo). I'd imagine the date would be sometime in November? Not sure, but the sooner we figure this out, the better as AGDQ is fast approaching. Someone should take charge since I can't plan nor host this marathon, but I'll try to help in any way possible. Man, i don't see any objective in this marathon or how it works. I don't know what is AGDQ. Is it a long pratice race? A long time trial race? A race where everyone races at the same time? I'm confused... I don't even know what F-zero game the players will use. 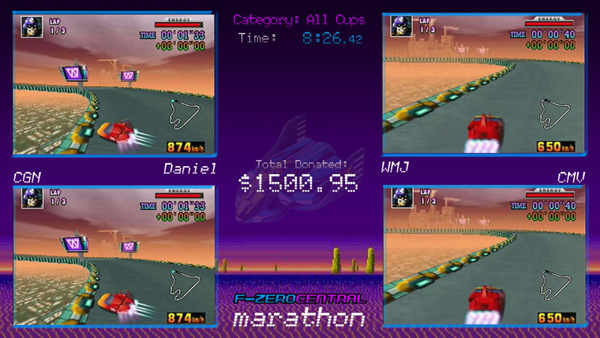 The objective of F-Zero Central hosting a marathon would be to help get runners to AGDQ, which is a week long speed run marathon to help raise money for Prevent Cancer Foundation. 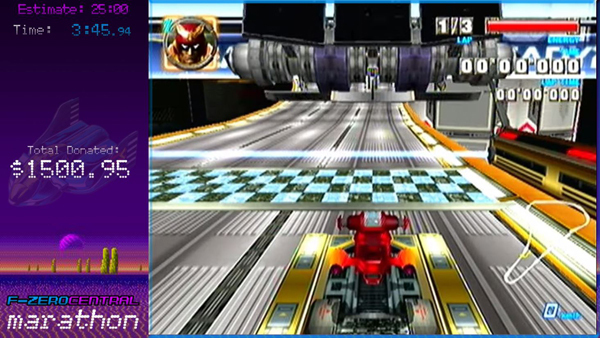 AGDQ will have 4 F-zero games, which is amazing since every single submission was accepted (F-Zero, F-Zero X, F-Zero GX, and F-Zero Climax). The FZC marathon would have every F-Zero game, plus EK for F-Zero X I think. Some would be solo runs of GP Mode, while the others would be races of GP mode. I don't really know, but having a host for the marathon would be a good first step in setting this up since we already have a list of interested runners. But, where everyone will race? Is it online or in a specific place? Does the races need video proof? I'm a brazillian and i can't record videos. It will all be streamed live via Twitch.tv. You do need a capture card to stream, so you aren't able to be a runner in the marathon. the most important thing is the host since that person will be receiving the streams from everyone else to stream the whole thing. so, who has internet good enough to become the host? 100 megabits down, 5 up. I've hosted a couple marathons myself, but someone with fiber would probably be a better choice. 90/9 here, but I also share it with my brother who also streams so it might be a bit less than that. Also, I can't keep my pc on all night, so if the marathon runs into the evening US time, I wouldn't be able to host that. Rather than have one person re-stream everthing, I think we should use one-persons channel (or create a channel) and share the stream key amongst runners. We should also establish what the goal is, so if AGDQ runners can post what their trip costs will be (plane ticket, hotel, food, etc) we can set a goal for the marathon. Hotel costs is $109 per night and 12% taxes puts that at $122.08. Split between 4 people is $24.416 per night. You can have more than 4 though, we had 8+ at one point in my room at SGDQ, but there are only two beds. If you want to get a group of 5 or more, post in here and we can see how many are willing to squeeze in (I'm an insomniac so I won't sleep much anyway). Where do we post how much we will need to attend AGDQ? Also, if needed we could just use fzerocentral's twitch channel for marathon and just give that to romscout so he could try to help us get more exposure via twitch front page. I'd like to bring up twitch's relatively new hosting feature (one of their few recent changes that are decent, the other big one being the ability to follow games). If you check your following page, there is a section for live hosts. Basically, it allows you to tell your followers to watch a particular stream through your channel. If a large amount of the people from F-Zero Central host the marathon on their channels, it'll help bring attention to the marathon. Type /host fzerocentral (or whatever the channel name is) in your chat to enter host mode, and /unhost to exit it. You kinda have to remember to type /unhost before you start streaming on your own channel again, otherwise, you'll still be hosting and nobody will be able to see your stream. EDIT: I couldn't tell you if it sends out an email notification similar to going live. I have email notifications disabled. Yeah I got access to that channel and could distribute the key for people to use. As for my costs it looks to be very expensive since I live so far away. Probably around 1500 dollars or something for just the travelling, but that sounds like too high of a goal for this marathon. I would need 350, which isn't a lot, but it's a lot if you factor in real life situations I'm in. I recall a marathon earlier in which money was raised to get JP runners to AGDQ. They exceeded their goal significantly, so I'm sure we can do the same, if not at least lessen the cost for us significantly. Not saying it can't be done, but if we want to do the same we really have to get on their level in terms of production quality. Their marathon was insanely well put together and that's a big part in why they had such success. I see a lot of potential to make an awesome event too, but it would require a lot of work, planning and commitment. And even if that happens I'm not so sure we could reach the same goal simply based on F-ZERO not being so popular or mainstream as some of the games that were played in that marathon. Also there's something about helping to send Japanese players over that I think might be more attractive for people since you rarely (if not ever?) see them at GDQs'. But who knows before it's done. I'd love to be proven wrong. In any case we should just try to focus on putting on as good of an event as possible and see where it takes us. Well, there was another huge factor as well, and that was that the word was spread pretty well in advance and had like 100 different people hosting it. People can't watch a marathon they don't know about. 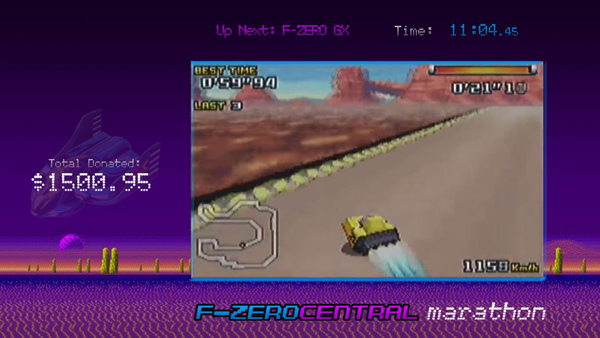 If somebody could make a quick banner of sorts with F-Zero Central marathon, and the url of the fzerocentral twitch page underneath it, and the date of the marathon for people to put on their streams/channel profiles, it would help spread more awareness of the marathon. Also if you ask other streamers you know (the "knowing them" part is important, sucking up to big streamers you don't know probably will just make you seem annoying) to spread the word, it'll help too. I know a couple people I could ask who might do it. Yazzo, who made the overlays you use? If we share the stream key and the overlays for all the streamers we could have a nice lookin stream. For races, people could stream to an alt account and I could restream it. I made those myself. I suppose I could try making some overlays (and a banner once we got the dates figured out) for the marathon as well, but in the near future I'll be pretty busy so I won't be able to prioritize it anytime soon. The weekends of November are looking like the best days so far, for everyone's availability. I don't think doing a 24-hour marathon would be a good idea from a viewer or streamer perspective. I think spreading the marathon over 2-3 days would be better. The reasons being we don't have the manpower for 24-hour streaming, and anything streamed at the off-hours would get barely any views anyway. The dates that work are any Friday-Saturday (excluding the ones where dreamhack/best of nes are on). November 7-8, November 14-15, November 21-22. We could also do Friday Saturday AND Sunday, perhaps we could have a bunch of races on Sunday, viewer suggested vehicles and goals. Alright so I made both overlays and a banner now. Let me know what you think, and if there's anything else that should be added or fixed. I guess the next step in terms of design would otherwise be to make graphics for the channel-page, but feels like we need to figure out other stuff first. So far the following people have responded through the form (Naegleria, Vallkyr, AKC12, StarkNebula, Yazzo, WMJ, yoshifan). That's a representative for everyone game (yazzo being on all 2D games though), and the availability for all people works for atleast part of the day during 22nd (Saturday) and 23rd of November. We could potentially do the 21st and 22nd as well, or all three, but with the amount of content we have I think it would be better to do just two days, and I figure the weekend would be better for most viewers, so it looks like the 22nd and 23rd is the dates this is happening. Unless someone responds after this point who can't make this, I think we should stick with these days. 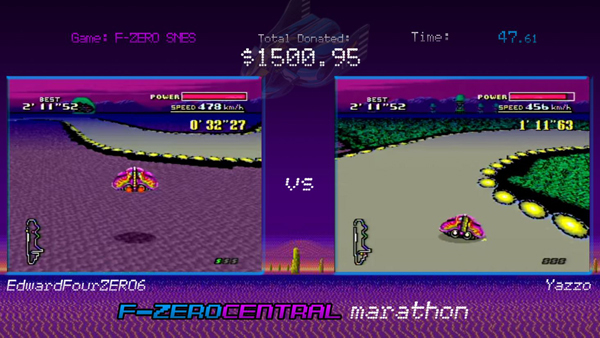 Go ahead and start advertising that then, November 22-23 F-Zero Central Marathon.